In a weird paradox, Iowa can celebrate a historically low unemployment rate and a growing economy while also being in the midst of a major workforce crisis. All across the state, employers are having trouble filling the increasing number of tech jobs. Almost every fast-growing company in the state is a tech company. Our other main industries, like agriculture, manufacturing, and transportation, are also increasingly reliant on technology. No matter what industry you work in, it’s already impossible not to work with tech. 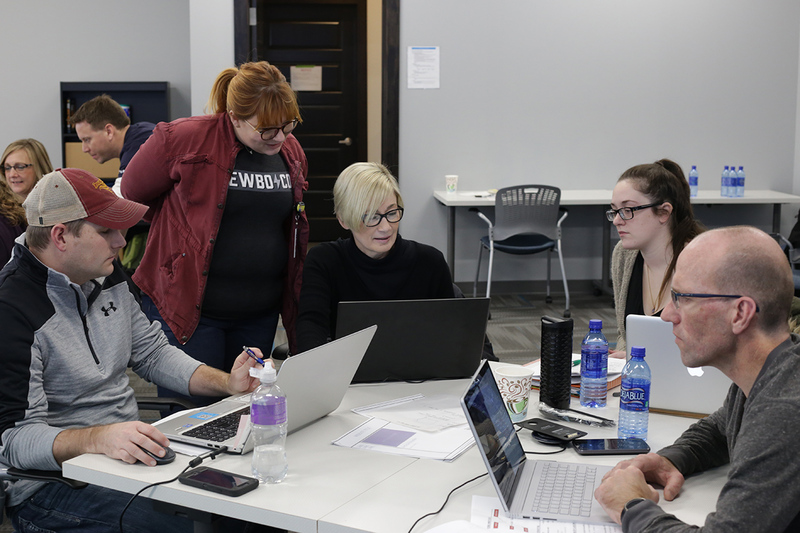 Companies across the state struggle to find the qualified candidates they need because there aren’t enough Iowans with the skills to fill these plentiful and high-paying jobs. For example, we currently have 4,363 open programming jobs, but last year, our universities only graduated 364 computer science majors. We’re simply not producing technical talent at the same rate that Iowa companies need it. Sponsor a high potential employee you want to retain to go through DeltaV and learn how to code. Sponsor DeltaV itself and gain access to the 2018 cohort while the class is in session so that you already have a relationship with the students by the time they graduate. We have multiple sponsorship levels available so you can choose how you want to interact with our students. Let NewBoCo sponsor your application developer apprenticeship and have your high potential employees go through DeltaV for their required training. We also have students that would love an apprenticeship, but don’t yet have an employer to sponsor them, so let us know if that would be a better fit for you. NewBoCo’s application developer apprenticeship is approved by the Department of Labor and DeltaV Code Schools provides official apprenticeship RTI (related technical instruction). Have a 501 course designed specifically for your businesses needs so that you can train your current dev team on new programming skills instead of outsourcing your work. If you want to explore how DeltaV can fit into your recruitment and retention strategies, please contact me at aaron@newbo.co or visit deltavcodeschool.com to register for upcoming class dates.